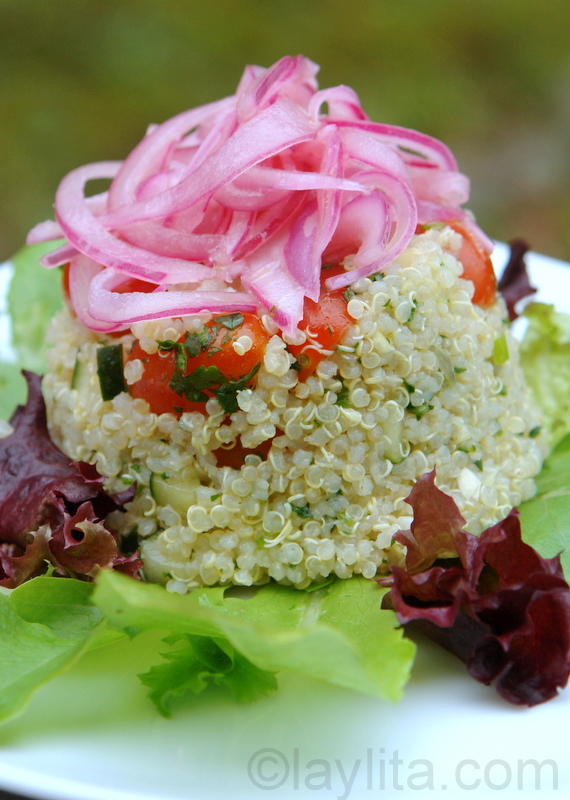 This easy and tasty quinoa salad with red pickled onions is made with cooked quinoa, cherry tomatoes, cucumber, green onions, lime juice, olive oil, cilantro. 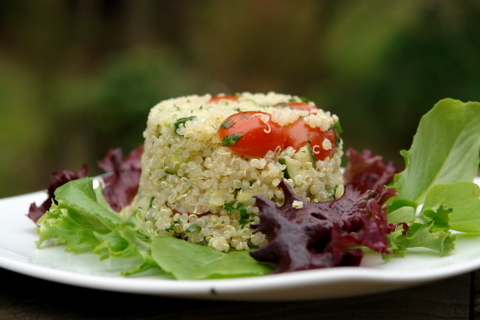 Do you tend to overeat or eat in a less healthy way when you eat out or are on vacation? Maybe it’s just me, but when I cook at home I am much more conscious about the ingredients I use and how much I eat, and we don’t go out to eat that frequently. However ,when on vacation we have to eat it out, and I find that for me, eating out = eat whatever you want. 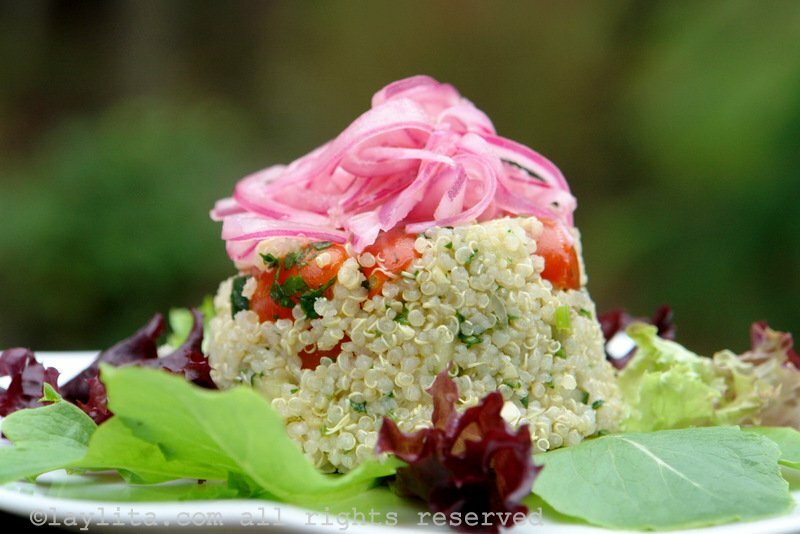 Quinoa salad with pickled red onions made with cooked quinoa, cherry tomatoes, cucumber, green onions, lime juice, olive oil, and cilantro. 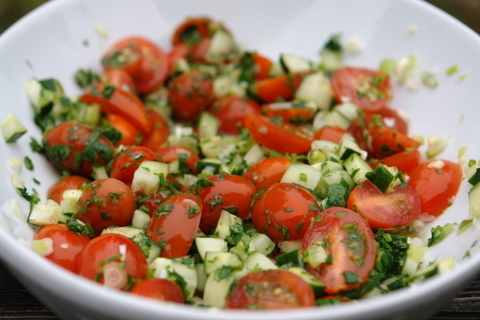 Mix the tomatoes, cucumber, green onions, cilantro, lime juice, olive oil, salt and pepper in a bowl. 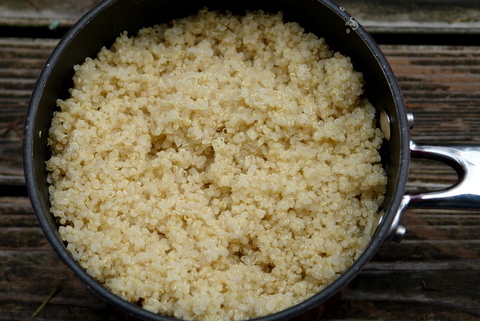 Add the cooked quinoa and mix well. Place the quinoa salad on the salad greens and top with the curtido or pickled onions. Also, when I cook at home I am less likely to be starving by lunch or dinner time (since I’ve been tasting everything) so I tend to eat less; but whenever we eat out I am so hungrythat I completely stuff myself. So, yes, the past week I’ve overstuffed myself, sometimes with good food and sometimes not so good( guess what I craved for lunch after skiing: hamburger, fries and beer/coke/red bull). Even then I do think it’s okay to give into those fast food cravings every now and then, but now I’m craving fresh and healthy food. 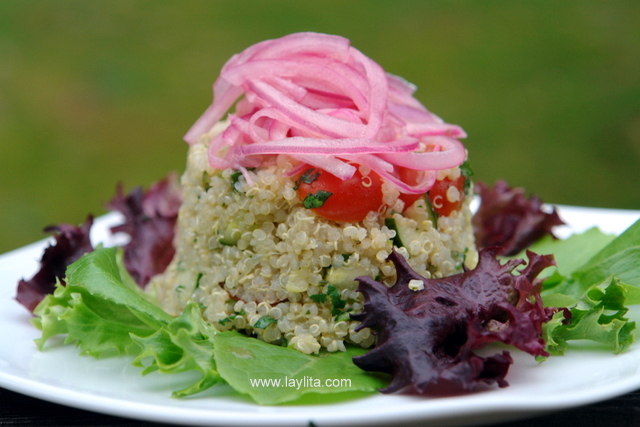 Something like this quinoa salad made with cherry tomatoes, cucumber, green onions, lime juice, olive oil and cilantro and topped with some cebollas curtidas or red pickled onions. 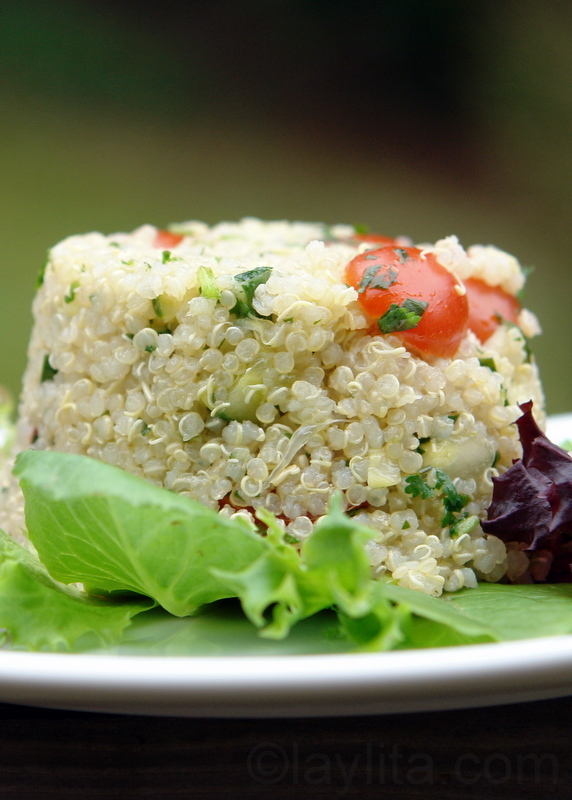 This salad is easy to make, very refreshing and with the carbs from the quinoa it won’t leave you hungry, even my sport obsessed (and therefore carbs obsessed) husband finds it filling enough for him, and unlike the hamburger, fries & coke combo you don’t think to yourself “why did I eat this?” after you’ve finished.A quinoa and vegetable salad works great as a light meal or also as side dish. 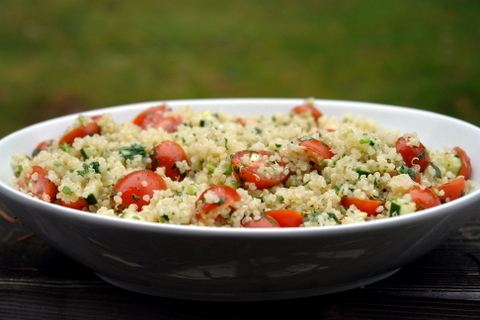 I have made this several times and it’s one of my favorite dishes now – really tasty and healthy. 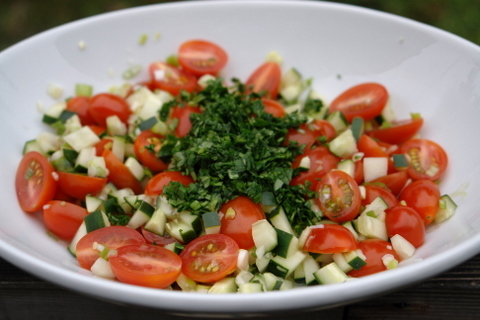 I like to use an herb salad mix that has fresh dill in it. The dill is a good complement for this. Made this easy and healthy lunch today, and was so impressed as I am with everything on this site. My partner loved it too. The cebollas curtidas are a must! Thank you! 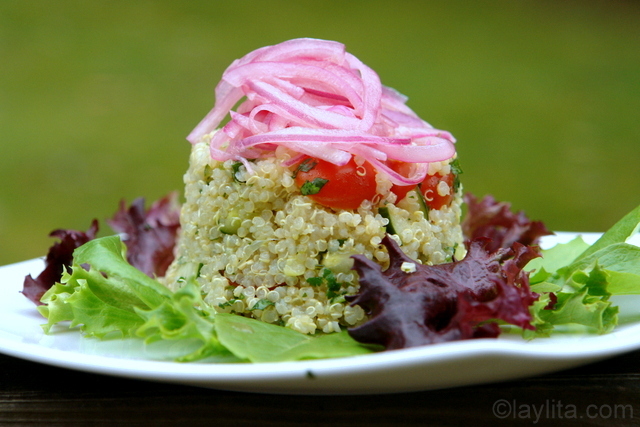 It’s a very Ecuadorian thing to serve pickled or lime marinated onions with almost every dish/meal. well this just looks fab and easy! I’M ON IT!! !